Ken has been a member of DPP since it was founded in 2001 and was instrumental in helping start the organization along with Diana – his amazing wife, DPP founder and Emeritus Executive Director. In addition to being Chair, Ken also manages all the business activities of DPP including finances, policy development, and reporting. Ken has been a member of previous DPP boards and has extensive knowledge of the history of the organization. Ken also contributes through his extensive business experience. Ken works with Accenture, one of the largest professional business and IT services consulting organizations in the world with approximately 450,000 employees globally. Throughout his 25­-year career with Accenture, Ken has worked with a number of large clients in various industries and government to help improve their productivity and quality, and reduce their cost to serve through the implementation of industrialized processes, tools, and best practices. Ken holds a Masters degree in Applied Science from the University of Waterloo in Canada. 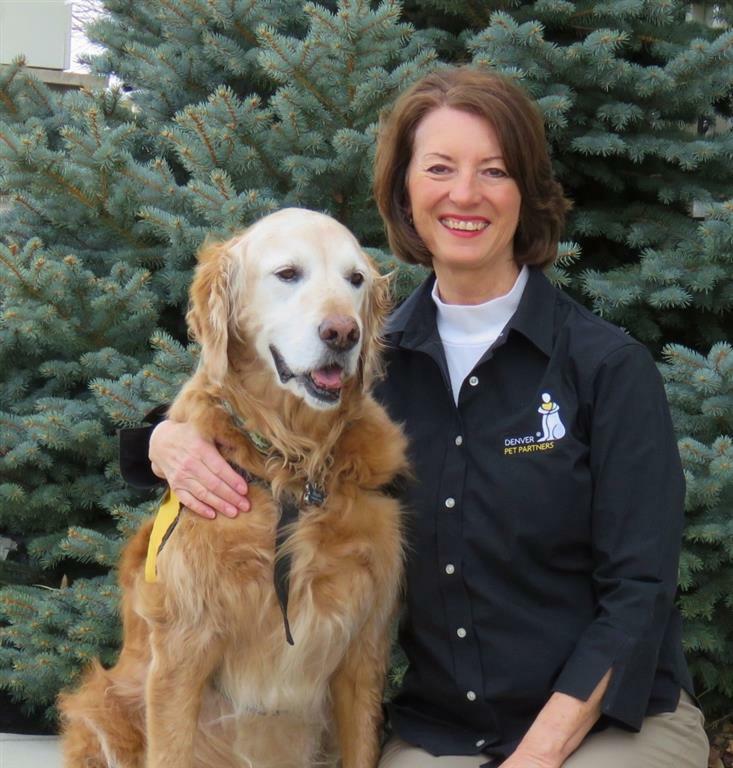 Susan and her Golden Retriever, Lucy, have been members of Denver Pet Partners since the summer of 2009. Since that time they have primarily served Life Care Center of Littleton supporting Physical Therapists with one -on -one activity that help individuals heal physically and emotionally from surgeries and other life altering events. This team has also added Rose Medical Center to their weekly rotation of AAI service and has volunteered for DPP in a number of other capacities. Susan’s corporate career included 25 years as a sales professional and director with CoreLogic, a nationally recognized leader of data and information tools providing solutions to businesses associated with real estate, mortgage finance, capital markets, and others. Her responsibilities over the years included client and territory development, customer training and support, as well as internal communication and collaboration. She is also a licensed Pet Partners evaluator. Susan lists hiking, fly-fishing, snowshoeing, snow-mobiling, and gardening as her top interests and passions after being a wife, mother, caretaker of two Goldens, and DPP volunteer. Laura has been a member of Denver Pet Partners since March of 2014. 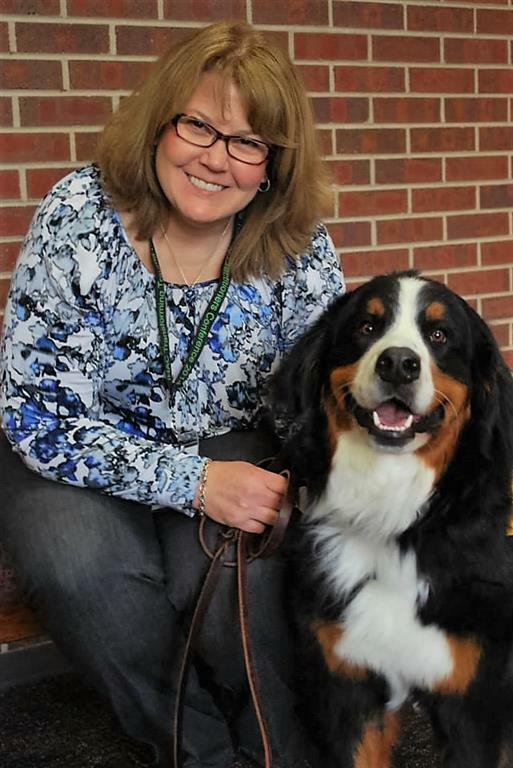 Her partner Addie, a Bernese Mountain Dog, has represented DPP at schools, libraries, hospitals, and universities, as well as at Denver International Airport. She is also a licensed Pet Partners evaluator. Laura worked as a technical writer and project manager for high tech companies in New York, New England, Seattle, and Colorado. She holds a B.S. degree in Technical Communications from Clarkson University and in January 2017 she received the Animals and Human Health (AHH) Certificate from the Institute for Human-Animal Connection (IHAC) at the University of Denver, Graduate School of Social Work. The program gave her a deeper understanding of the human-animal bond and the ethical and humane considerations of Animal-Assisted Interventions (AAI). Laura and her husband are both New York City natives who have long called Colorado home and who have come a long way from New York – they live on 99 acres of land in the beautiful Palmer Divide area north of Colorado Springs, where they formerly operated a horse boarding business. In their free time, Laura and Hal love to travel and have visited 40 states and more than 25 countries. 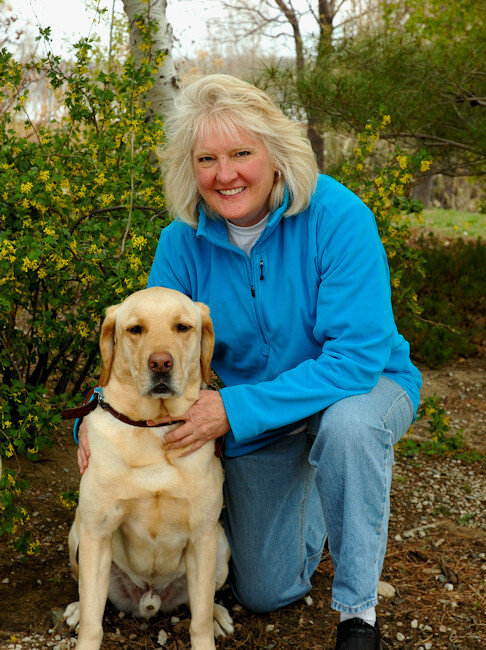 Linda has been a member of Denver Pet Partners since 2006 when she trained and evaluated with her first therapy dog, Toby. Since then, she has volunteered at Swedish Medical Center visiting patients, staff and visitors with 3 additional canine partners, Kenzie, Katie, and now Willy. Additionally, Linda has participated in reading programs and spoken to community groups, college classes, and other volunteer groups about AAI. 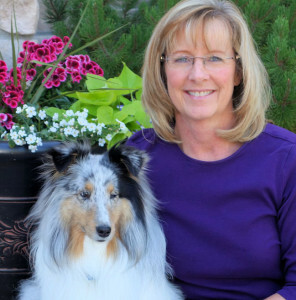 She is a licensed Pet Partner Evaluator and Instructor and has conducted many training classes and evaluations. In her professional life, Linda was a 33-year science educator and professional writer with Denver Public Schools. Her happiest moments were in the classroom, but she found much satisfaction as an instructional leader and mentor for new teachers and teachers in training. After retirement, she began her volunteer ‘career’ at Denver Zoo where she has spent many rewarding years as a docent giving tours to visitors of all ages. Today, Linda continues her Zoo work as an animal handler for educational/public programs along with her DPP work at Swedish Hospital. Both Denver natives, Linda and her husband can’t imagine living anywhere else and have many wonderful friends and family in the area. They’ve traveled extensively around the U.S. as well as England, Europe, Australia and New Zealand. Sandy has been a member of DPP since July of 2014. She was the DPP Program Coordinator which encompassed working closely with Instructors, Evaluators, and the DPP membership in organizing Workshops and Evaluations. She is also a licensed Pet Partners evaluator. Sandy is a wife and mother of two boys, one living in Illinois and the other in Michigan. She and her husband retired and moved to Colorado from Ohio. She has been an active volunteer through various clubs, groups, and organizations for the past 20+ years. These many experiences have given Sandy the opportunity to meet and work with many interesting people, to assist in organizing meetings and events and, most importantly, to communicate with and engage members to actively participate within the organization. Sandy visits with her Sheltie, Greyson, at The Medical Center of Aurora and Rocky Mountain Cancer Center. She and Greyson enjoy attending other DPP events when available. Other interests and hobbies include, scrapbooking, crocheting, hiking, and skiing. Linda has been a member of Pet Partners since 2007 and has been registered with two dogs, Dillon and Darby. Linda and her first partner, Dillon, have visited in four hospitals, libraries, schools, and at Denver International Airport. Linda and her husband, Michael, have been very active in visiting facilities with their two golden retrievers over the past decade. They recently lost their younger therapy dog, Darby, who succumbed to cancer. 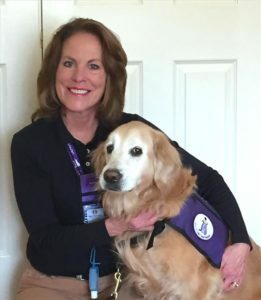 Linda has helped start therapy dog programs at 3 Colorado hospitals. She currently coordinates the program at Parker Adventist Hospital and co-coordinates the program at Castle Rock Adventist Hospital. Dillon, now 13 years old, is semi-retired and visits the hospitals on a limited basis. Dillon continues to visit medical students at Rocky Vista University on a regular basis. Prior to retirement, Linda was a Medical Practice Administrator. Linda managed several specialty medical practices in Arizona. Additionally, she helped several physicians establish their practices. This included the responsibilities of site selection, equipment purchases, budgeting, hiring, and marketing. Prior to moving to Arizona, Linda also managed the Long-Range Planning and Medical Staff Services functions at a Wisconsin hospital. Linda also owned a travel agency in Wisconsin and was the Treasurer for the local American Cancer Society. Linda has been volunteering since she was 18 years old, beginning as a “candy striper” in a Chicago hospital. She has volunteered at the Ronald McDonald House in Madison, Wisconsin, and was the parent manager for a high school hockey team. 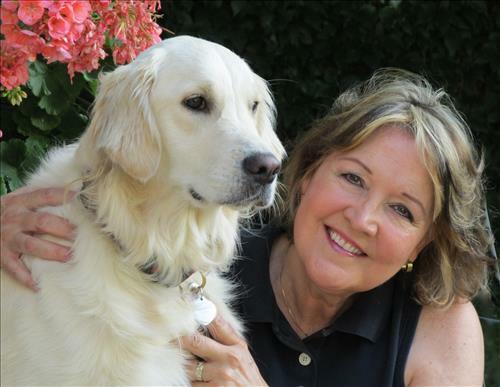 Linda has volunteered with the golden retriever rescue organizations in Arizona and Colorado, conducting home visits. Linda considers the time volunteering with her two golden retrievers as the highlight of her volunteer career. In the thousands of encounters with patients, staff, visitors, and the public, she has witnessed the power of the human-animal bond. Linda feels that it has been a privilege to have the ability, through her dogs, to impact so many people over the years. Linda loves hiking, fly fishing, RV camping and wildlife photography. She is a faithful fan of her home sports teams, the Wisconsin Badgers and Green Bay Packers. She loves spending time with Michael and their 3 children, 4 grandchildren, and with sweet Dillon. 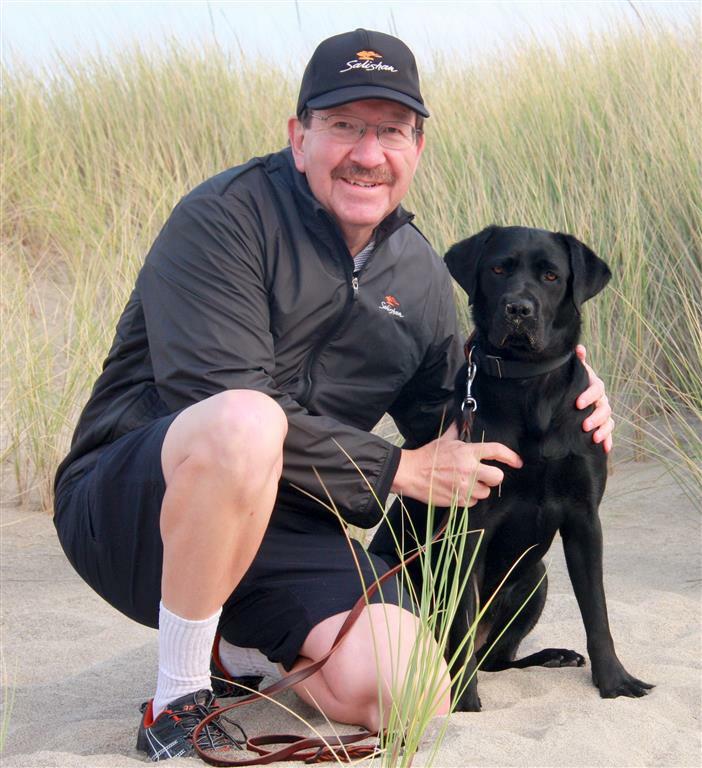 Patt Bisant has been an active member of Denver Pet Partners since 2010. With her Partner of more than seven years, Jake, they have made monthly trips to the AnyThink Library in Commerce City for the “Tails to Tales” R.E.A.D. program, as well as weekly visits at Platte Valley Medical Center and the Adams/Broomfield Counties 17th Judicial District Victim Witness and Truancy programs. In 2013, they became involved with grief support at a special monthly children’s communal burial service (called the “Angel Bed Project”) at Mount Olivet Cemetery in Wheat Ridge, Colorado. Patt is a native of Colorado and was raised in the Denver area. She holds a B.S. from the University of Colorado, and an M.S.S. from Denver University. She has more than 30 years of management experience in sales & marketing in the Cable and Satellite Television industry. Patt lists family, traveling, genealogy, bowling, and gardening as her top interests and passions.